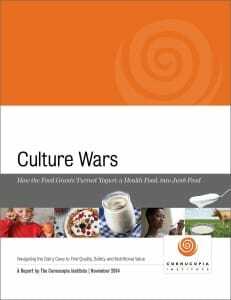 A new report, Culture Wars: How the Food Giants Turned Yogurt, a Health Food, into Junk Food, issued by The Cornucopia Institute, accuses Dannon, Yoplait, Chobani and other major marketers of misleading parents, who are looking for healthier foods for their families, into purchasing yogurts loaded with sugar and containing a myriad of questionably safe artificial sweeteners, colors and emulsifiers. The group alleges that agribusiness, in their marketing approach, has capitalized on yogurt’s historic, well-deserved healthful reputation while simultaneously adulterating the product, sometimes illegally, to gain competitive advantage and popular appeal. In addition to The Cornucopia Institute’s comprehensive report on the yogurt industry, they also released a related scorecard rating 114 brands and separating the truly healthy options from those that would be found on any dietitian’s shortlist of foods to avoid. Cornucopia, a Wisconsin-based food and farm policy research group, found that the flavored varieties (strawberry, for example) of certain brands contain no actual fruit, and include total sugars that rival those in candy bars. Alternatively, rather than with sugar, some yogurt is sweetened artificially with such substances as aspartame (also marketed as NutraSweet®). According to Dr. Qing Yang, a professor of molecular, cellular and developmental biology at Yale University, “A rise in the percent of the population who are obese coincides with the increase in the widespread use of non-caloric artificial sweeteners such as aspartame and sucralose.” The use of aspartame is controversial and has been linked to brain tumors and neurological diseases in laboratory animals. Non-caloric sweeteners are not the only controversial materials found in many popular brands of yogurt. Another, carrageenan, a bioactive ingredient derived from seaweed, has been linked in published research to serious gastrointestinal inflammation and disease. Some of the yogurts specifically aimed at young children, in squeezable tubes, are among the offerings containing carrageenan. In addition, yogurt manufacturers add artificial colors, which have been linked to attention deficit hyperactivity disorder in children. Some manufacturers have even started adding nanoparticles, currently unregulated, which interact with cells in unknown ways. Cornucopia’s report also looked at the industry’s labeling campaign: Live and Active Cultures, which purportedly assures a high level of healthful probiotics, which are microorganisms thought to improve digestion in the intestinal tract. Cornucopia tested yogurt purchased directly from the dairy cases, in grocery stores, rather than the industry’s practice of testing at the factory prior to shipment. The report’s finding revealed that many of the top-rated organic brands in Cornucopia’s buyer’s guide — that are not part of the industry’s Live and Active Cultures marketing campaign — actually contain higher levels of beneficial bacteria than some of the most popular brands displaying the seal. The University of Nebraska’s Food Processing Center conducted the testing. “Our laboratory analysis also showed that there are nutritional benefits to eating whole milk, organic yogurt,” said Dr. Linley Dixon, one of Cornucopia’s researchers. The Cornucopia study, consistent with other recent peer-reviewed and published findings, found that organic yogurt had more advantageous ratios of omega-3 to omega-6 fatty acids and higher levels of beneficial fats, including conjugated linoleic acid (CLA), than conventional yogurt. “The reason that Kraft has to call Velveeta® ‘processed cheese-food’ is that some of the ingredients used, like vegetable oil, cannot legally be in a product marketed as ‘cheese’,” Kastel explained. Cornucopia alleges that some of the ingredients manufacturers use to produce yogurt, such as milk protein concentrate (MPC), typically imported from countries like India, do not meet yogurt’s current legal standard of identity. 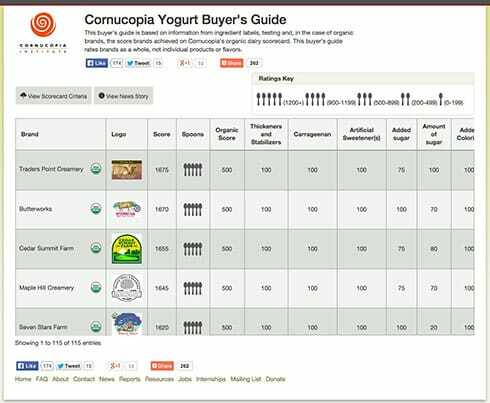 Finally, Cornucopia looked at the comparative costs of yogurt on the market. The report found that many organic yogurts can often be purchased for less, on a price-per-ounce basis, than conventional yogurts. This price comparison includes many of the popular Greek styles and heavily processed products, in special packaging, that are marketed to children, like Yoplait’s Go-Gurt and Dannon’s Danimals, with their long lists of artificial ingredients. The healthiest choices in Cornucopia’s study include yogurts with a short list of ingredients, including organic milk and live cultures — with limited amounts of added organic fruit or unrefined sweeteners such as maple syrup. One of the most cost-effective and advantageous choices for consumers, especially parents, is to purchase larger containers of plain organic yogurt and mix them with fresh fruit and/or granola. In addition to the synthetic sweeteners, and sometimes cane sugar, many yogurt products also contain high fructose corn syrup, some with exceptionally high levels of fructose. “This highly refined sweetener, also controversial with many dietitians, is misleadingly labeled as ‘fructose’ on ingredient lists, leaving off any reference to corn syrup,” added Dr. Dixon. In a Harvard study released last week (October 13), and published in the Journal Molecular Metabolism, researchers found that fructose may promote obesity and diabetes by overstimulating a hormone that helps regulate fat accumulation. The American Heart Association (AHA) recommends that no more than 5% of calorie intake come from added sugars. That means limiting added sugar intake to 6 teaspoons per day for women and 9 teaspoons for men. The AHA says that most Americans consume between 22 and 30 teaspoons of added sugars per day. The entire recommended daily limit can come from a single serving of sweetened yogurt. As an example, Fage 0% fat, honey flavor yogurt contains the equivalent of 9.34 teaspoons of sugar, with Yoplait’s Go-Gurt Blueberry Blast coming in at 7.07. There is also some question as to whether some sweeteners and other artificial ingredients added to yogurt might disrupt the microbiome in the gut, which, for many, eating yogurt with live cultures is an attempt to beneficially support. In another gut-wrenching twist of irony, many people with inflammatory bowel disease (IBD), or other intestinal maladies, eat yogurt because it is cultured with beneficial bacteria. However, independent, peer-reviewed published research indicates that carrageenan, included as a thickener in some yogurt, can greatly exacerbate the conditions. Some manufacturers, including WhiteWave (Horizon), have recently announced that they are removing carrageenan from their natural and organic products. Additionally, vegetarians may be surprised to find that many yogurts contain gelatin, a byproduct of slaughtered animals, which is also added as a thickening agent.